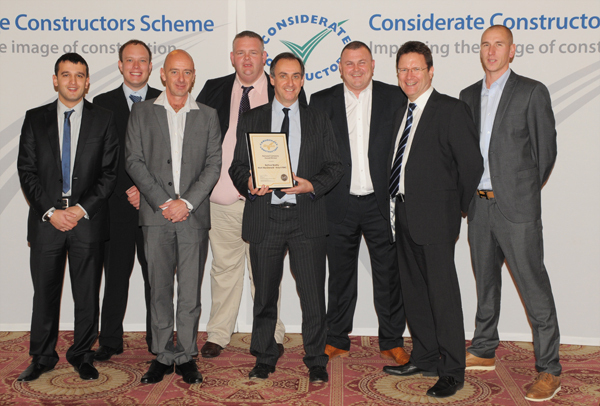 Please see below for the companies who were awarded a Gold Award at the Considerate Constructors Scheme’s National Company Awards 2013. This joint venture company delivers project management, design, construction and consultancy to the highways maintenance industry. Monitoring of this company included visits to area depots for major Highways Agency maintenance contracts, and to a works area undergoing road adaptations. an “incident and accident” reporting tool. This delivers photographic evidence instantly back to the depot and raises reporting procedures to a new level. A further innovation was the ongoing display of artwork created by the staff’s children to remind the workforce of their personal responsibility to work carefully and return home safely each day. Concern for the overall safety of staff and visitors was particularly strongly observed, and supported by clean and tidy general areas and excellent overall presentation. The same ethic was evident at the work location, together with a real awareness of potential community disturbance. Throughout the company, considerate construction techniques were clearly and successfully embedded. This company, founded in 1971, provides specialist civil engineering and piling throughout the UK and Ireland for residential, commercial and public authorities. Scheme Monitors visited two company sites, and found the levels of considerate construction to be equally high at both locations. Safety was a very high priority, and daily briefings were supported by toolbox talks, regular inspections and the training of certain operatives for safety observation. Vicinity safety alarms automatically shut down piling operations if an operative entered the area, and each piling operation was also very well screened and protected. The approach to caring for the workforce was of an equally high standard with forward-looking benefits well above the legal minimum and an enlightened approach to workplace issues. Site welfare facilities were excellent and operatives’ occupational health was periodically checked by a local health professional. Career development was also strongly encouraged and information on training courses was widely displayed. Taken together, the various considerate aspects observed showed great attention to detail and a real commitment to the aims of the Scheme. Operating in London and the Home Counties, this company designs and delivers refurbishment and office fit-out projects, together with annual maintenance agreements. The company’s refitting of an office space on the 29th level of London’s Gherkin building demonstrated their clear commitment to considerate construction. Though only a three-week project, excellent levels of communication were maintained with all neighbouring office tenants and an atmosphere of goodwill was generated. Much of the work took place at evenings and weekends and yet this interaction was successfully maintained. Of particular note was the excellent levels of cleanliness and presentation throughout, coupled with first class signage and information boards. The use of skips was avoided by the segregation and bagging up of waste, and its removal by company vehicles for recycling or reuse wherever possible. This was underpinned by a strong environmental policy which was regularly monitored. Staff who normally used breaks for smoking outside were offered incentives to help reduce their habit, and excellent temporary facilities arranged for office visitors. 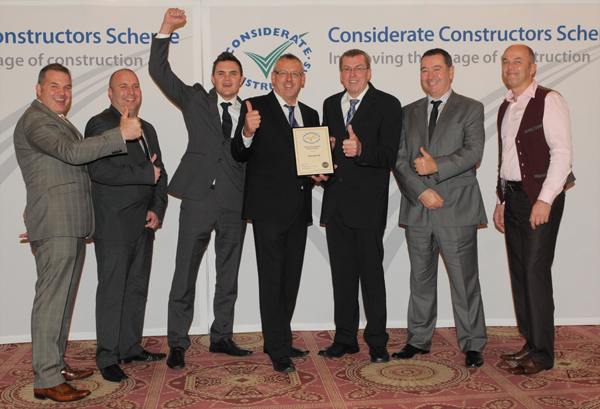 All these elements combined demonstrate a company achieving real success in considerate construction. This Maldon-based company operates across a number of sectors, with particular emphasis on refurbishment and new build. The Scheme Monitor visited one new build of a semi-detached home destroyed in a fire and a residential home’s refurbishment project in Braintree, Essex. In both examples, first-class presentation was supported by excellent neighbour relations and the clear willingness to go the extra mile wherever possible. Visitors to the refurbishment project often assumed the operatives were council workers and requested various services, but rather than simply refer them to the council the staff would pass on the details directly to the correct council department. Classes were provided for residents on maintenance, repairs and decoration and this will soon be extended to safety around the home. At both locations great attention was paid to noise control and the use of battery-powered tools. Site neighbours were well-informed of any potential nuisance and arrangements made to minimise the impact. This company operates an equal opportunity policy and practices an ethos of mutual respect and fair treatment for all. Ongoing training includes the proper treatment of tenants and neighbours, and the result is a friendly yet highly professional company dedicated to real consideration. This company undertakes responsive repair work on local authority housing for the City of Sheffield, involving around 150 vans and their operatives. The Scheme Monitor’s visits included the depot and offices, plus three operational locations. 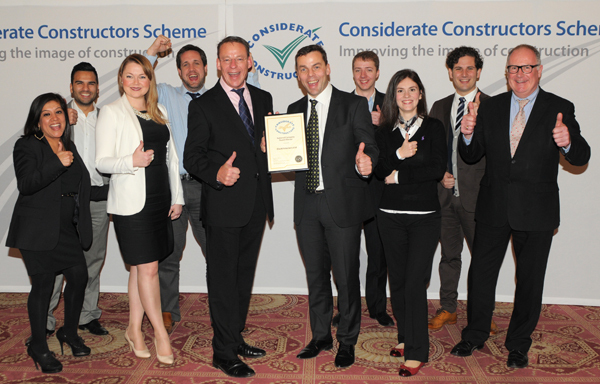 In his report the Scheme Monitor described the overall considerate performance of this company as “excellent”. Particular attention had been paid to making enquiries from tenants for repairs as simple as possible for them to action, and an innovative mobile phone app had been created and supplied to make this even easier. The depot itself was very accessible for visits by tenants, and included respite facilities for those whose properties were undergoing any major work. Of particular note was the company’s creation of a “handyperson” scheme to provide free-of-charge assistance to older and less able people not covered by the main repair service. This was widely appreciated and created an extremely positive profile of the company. 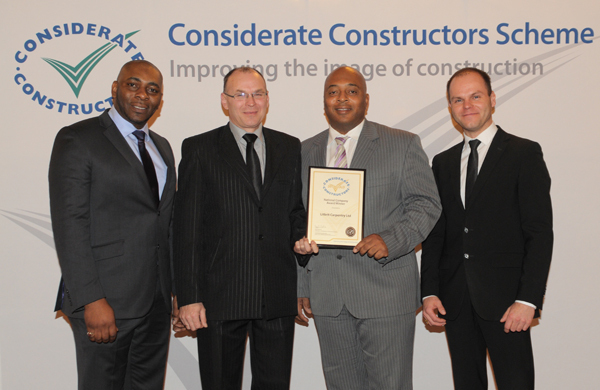 Overall, the detail of considerate construction was observed to a high degree, and the excellent presentation of staff, vehicles and work areas made the operations a first-class endorsement for the aims of the Scheme. This company provides responsive maintenance and repairs for the City of Sheffield’s corporate buildings stock, including schools, public buildings, and care homes. Staff comfort, safety and presentation is taken seriously by this company, as evidenced by the comprehensive workwear supplied to operatives. In addition to the normal branded work shirts, staff are issued with boots, cargo trousers, thermal wear and jackets. Vehicles are often washed while spares are being collected, and the company is increasingly using courier-style motorcycle transport to deliver spares not carried on the vans to work sites. This not only saves time, but also saves fuel and reduces CO2 emissions. Health and safety issues amongst the customers, general public and the workforce were also a priority with the continued goal of no accidents. There were specific experienced teams for aspects such as working at height while constant auditing was supported by regular safety briefings. The provision of face fitting masks for all operatives further demonstrated the safety and occupational health commitment. This company strongly encourages staff feedback and discussion together with the sharing of new ideas. As a result, there is an ethos of constant improvement and genuine inclusion which supports the success of its considerate efforts. Based in Woodford Green, Essex, this carpentry contractor was monitored at a major housing project in Hendon, North London for which they were subcontractors. Though naturally subject to the standards required by the main contractor, this company nevertheless exceeded requirements in many instances and demonstrated their own considerate standards. Excellent welfare facilities were provided for the workforce, and mandatory training was complemented by the general encouragement to interact and share ideas. All employees were issued with ICE pouches so that each person carried their personal details and any relevant medical information with them at all times. Operatives are also encouraged to use public transport for travelling to and from work to reduce the company carbon footprint and ease road congestion. Noise control was of a particularly high standard with regular monitoring and low-noise or battery-operated power tools used extensively. Dust suppression was equally well controlled and the cleanliness of the work areas was exemplary. The company also maintains its own complaints procedure as well as the main contractors, plus its own independent health and safety inspections. The success of the company in exceeding the main contractor’s requirements was clear, and the overall considerate impression was extremely positive. M & D Building and Decorating is based in London and provides a wide range of services across the capital and beyond. For this company, the Scheme Monitor visited a total refurbishment and alteration project on an empty five-storey home in a residential area. From the outside there was little to indicate that building operations were in progress thanks to very low noise levels and a very tidy street presentation. Contact had been made with all neighbours bordering the project, and regular information was provided on work progress and any potential disturbance. A site plan was devised to manage dust and debris, a waste recycling score of 88 per cent was achieved and timber was re-used on site. The company also sourced both labour and materials locally. All site areas were well maintained and orderly, and staff welfare facilities were similarly well-managed. Developing the skills of it operatives is also of great importance to the contractor with training needs reviewed regularly. It was clear that both the company and its operatives were well-briefed on considerate construction techniques and applying the practices as widely as possible to great effect. 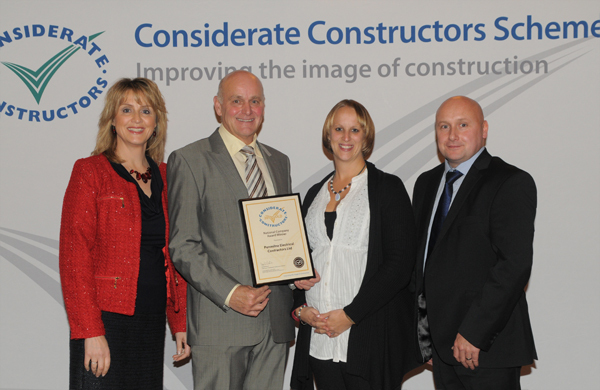 Maxiflow Ltd were also awarded the title of Most Considerate Company. 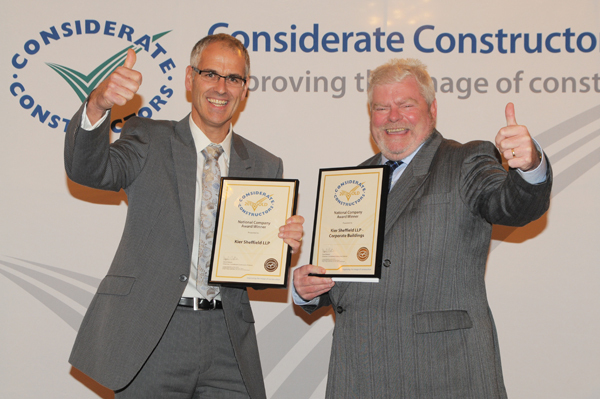 Norriskips & Waste Management were also awarded the title of Most Considerate Company Runner-up. Established in 1977 and based in Hitchin, Hertfordshire, these electrical specialists cover work for commercial and domestic customers together with local authorities over two counties. A major project for the company was the rewiring of over 400 tenanted homes, with many of the tenants elderly or otherwise vulnerable. Throughout the works, the company demonstrated a clear ethos on tenant care and consideration which greatly exceeded required levels. Personal visits to each home preceded the work, and this was followed up by further visits to ensure satisfaction after commencement. To aid security, minimum branding appeared on vehicles and workwear, and the works areas did not resemble a building site operation from the outside. Many examples of extra work done for individual tenants free of charge were observed, and the friendly, helpful nature of the workforce was noted by the tenants. With details such as using low-wattage power tools to avoid electrical tripping, and a strong environmental policy in place, this company demonstrated a real and growing commitment to considerate site practices. 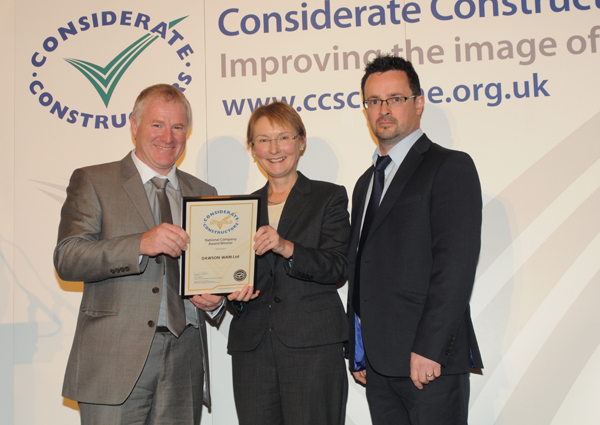 Tasker Catchpole Ltd were also awarded the title of Most Considerate Company Runner-up.